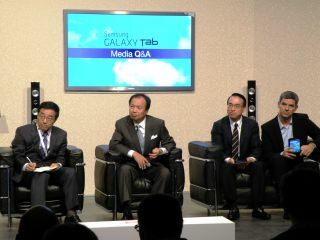 Samsung has stated that it doesn't believe that the Apple iPad is stronger in any area than the forthcoming Galaxy Tab. "Its advantages are: communications features, something we have that doesn't exist in the iPad, and we expect consumers to enjoy video chat. "In terms of weight, consumer research tells us that a [lighter] weight is very critical to enjoy the experience." This is a good thing for Samsung, seeing as the Galaxy Tab is almost half as heavy as the iPad. "When you want to send a message, one finger operation is very important. In addition, Android fundamentally has access to many applications that Google are providing, in addition to what Samsung is planning too, such as on the media and music experience. "But the most important thing for the Galaxy Tab is portability. It has the capability to support voice, so wherever or whenever you are you can make a call." "Previous tablets are seen more as 'living room devices', because people are putting them on a table or on their lap, and have to use two hands to hold. "This means their device is defined as living room, where ours is on the go." There may be a key difference in terms of strength between the iPad and Galaxy Tab, though – if the rumoured £600+ tag comes for Samsung's tablet then Apple will have a big advantage over its Korean rival.